A landmark in Dubai, The Palace is a regal domain where guests wander amidst abundant gardens and stroll amongst the meandering waterfalls and streams. All guestrooms and suites are sea facing, with private balcony or terrace and adorned with ornamental arches, terracotta tiling and custom made furniture. The Palace at One&Only Royal Mirage conjures the magic of Arabia, a domain where guests may wander amidst the abundant gardens or stroll amongst the meandering water features. 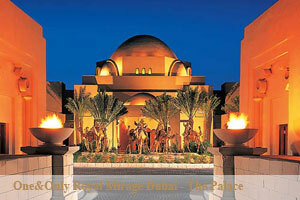 The Palace at One&Only Royal Mirage has 173 guestrooms, 53 Gold Club rooms, 18 Suites and 2 Royal Suites, all are sea facing, with private balcony or terrace and adorned with ornamental arches, terracotta tiling and custom made furniture. The vivid colors echo the myriad that make up the Arabian Gulf, while the soft tones recall the desert landscape. The Health and Beauty Institute, designed to reflect the spirit of the Orient with towering domes and carved arches, features the Givenchy Spa, a traditional Oriental Hammam, Hair Salon and Fitness Center. The services of the Fitness Studio include an exercise and private massage rooms. The resort has its own extensive private beach on the Arabian Gulf. There are impressive temperature-controlled swimming pools at each hotel. Watersports include sailing, Hobiecats, kayaking, windsurfing, water-skiing, fishing, scuba and snorkeling. Improve your game day or night on the three floodlit tennis courts. One&Only Royal Mirage overlooks the Arabian Gulf with a kilometer of private coastline in sixty acres of landscaped gardens, water fountains and meandering pathways. It is 20 minutes from Dubai International Airport and opposite the prestigious Emirates Golf Club, and 20 minutes from the City Center, the Gold and Spice Souks and the desert.